Is all about exercising full control over your body. There are many styles or ways of practicing it – some are more relaxing while others are more dynamic. All forms of Hatha involve working with the body, developing both our breathing and our powers of relaxation and concentration. However, each style addresses these aspects in a different way. Among the many strands of Hatha Yoga that inspire our classes are: the calmness of Sivananda-style yoga; the dynamic and challenging Ashtanga style; the harmonious transition between postures offered by the Vinyasa style, and the focus on postural alignment provided by Iyengar. Of course, the general nature of the classes will also depend on the teacher and their particular style preferences. Though classes can either be relaxing or dynamic, easy or advanced, they all share the primary objective of awakening a new state of wellbeing and happiness in our practitioners. Despite the differences between styles, all of our classes offer the opportunity to work closely with one’s body, breathing and concentration. All the same, each teacher will work with these various elements in their own preferred way. Is a traditional style of yoga from the north of India. Developing the “basic” postures forms the backbone of these classes, as does the repeated practice of breathing, concentration and relaxation techniques. Sivananda classes are designed to favour a harmonious and comprehensive development of the body and mind, which, in itself, helps produces a general state of good health and wellbeing. Is a dynamic and extremely intense and powerful system, based primarily on the synchronisation of breathing with movement. It is recommended for those who prefer an intense and purifying activity. 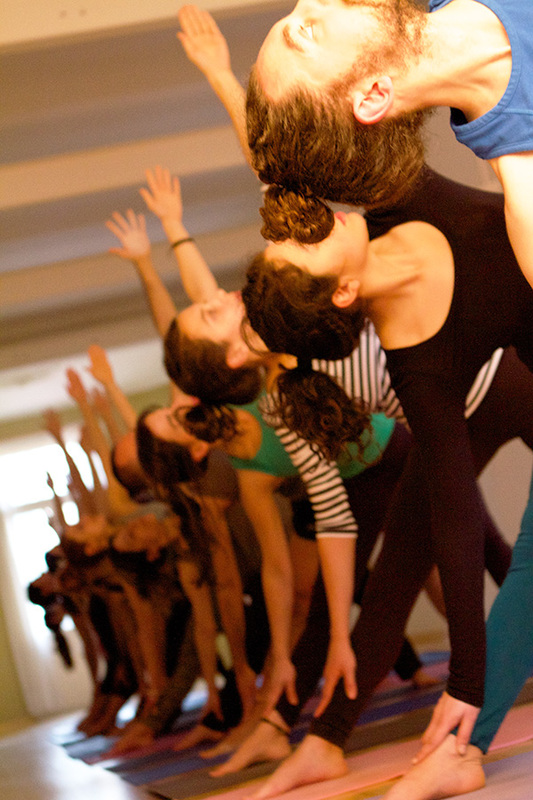 In guided Ashtanga classes the teacher steers participants through the first series. Meanwhile, in Ashtanga Mysore, you will learn the more traditional way of practicing this style of yoga. To attend these classes you must already be familiar with the Ashtanga style and the various ways of moving in and out of postures and coordinating movements with breathing. Is characterized by slow movement, attention to detail and the adaptation of poses to suit each individual’s needs. Though it has fewer poses (asanas), Inyengar Yoga does require complete physical, mental and emotional involvement in one’s practice. The postures are extremely helpful for learning precise body alignment, as well as how to adapt the asanas to suit the specific requirements of our bodies, using props such as straps, blocks and cushions. In these postures we learn how to develop the Vinyasa element of yoga, which allows us to synchronise movement with breathing and to link postures with a series of movements and jumps for the purpose of maintaining concentration and creating heat in the body.